Today, I'm guest posting over at Oranges and Apples while Franca is off having a baby. If you are interested in some further Me Made May provoked naval gazing, and just a general observation about me, what I want to wear and how that has changed, then you can read the post here. How to make wrapping paper bunting. I'm not sure this can really be called a tutorial, but I thought I'd share how I made this for Small Boy's birthday recently. I didn't come up with the idea myself - I borrowed the construction method from someone else (I saw it at a friend's house) - but I did come up with the idea of using wrapping paper myself. Aren't I a clever girl? You could absolutely choose any type of paper for this. The inspiration bunting was made from brown parcel paper, and some pink paper that looked to be of equal weight, which were strung onto ribbon. It was far classier, and prettier than my version. But I wanted to make this for a 5 year old, to brighten up the Scout hall where we had his party, so bright, colourful and cheap were the order of the day. You could use wallpaper, coloured paper, newspapers or magazines or even an old telephone directory. Or you could go all Jackson Pollock (or let the kids do it) with some paint and a big roll of white paper. First make your template. Decide how big you want your "flags", or triangles to be, and then draw onto cardboard. Then, along the top of the flag/triangle, draw another triangle, upside down, which should be the same size. So you end up with a diamond shape. My flags were 10cm across, by 13cm in length, so my diamond measured 26cm in length. The width obviously remained 10cm. This looks assymetric, but that's just the angle I took the photo at. Use the template to draw round and then cut out lots of diamonds from the paper. I used the wrapping paper that comes folded, with 2 sheets (and gift cards) in a pack. I got 36 flags from one pack. I also cut it folded once, so I was cutting 2 at a time, much like cutting fabric! Fold the diamonds in half, creating triangles. Fold the diamonds/triangles over the string, and then staple in place, spacing the flags as you prefer. I used one staple, but for larger flags, you might want to do two. You can staple the flags to the string, but I stapled to one side of the string, so I could slide the flags up and down as required. Leave long ends on the string, to tie the bunting up, and then cut string to length. Sometimes you get great photos for your blog post. You're in the mood, you make the effort; brush your hair and put on some lippy, the light is good, you are having fun and have some semi-decent poses. And sometimes they are just awful. You can't be bothered, you wear the top with trousers that don't even match, because changing them would require taking your shoes off. The sun is in your eyes, you are sleep deprived and you are pushed for time. Even your t shirt is grumpy and the stripes refuse to behave, jumping around all over the place*. But even though you hate them, you really cannot face having to do them again. Guess which camp this blog post falls into? Ah well, onwards and upwards! *I believe the technical term is "moiré". My second and last make during Me Made May, made in direct response to seeing a gap in my (handmade) wardrobe. That feels really good. 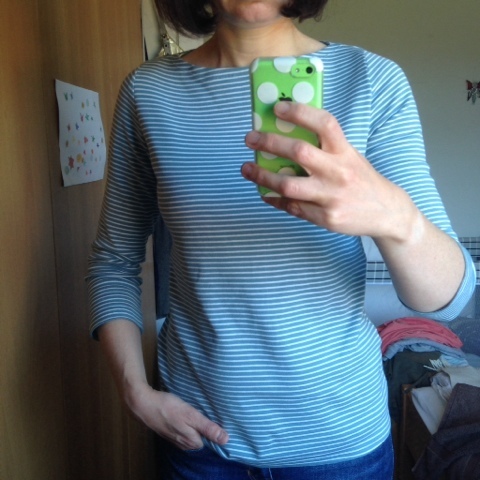 I posted a round up of my MMM thoughts separately, but I have mentioned already that I was struggling a bit with not wearing my RTW Boden breton stripe tee. I have had this tee for 4 or 5 years and I wear it all the time. Probably at least once a week, unless the weather is really, truly hot. It's my perfect tee. I love the shape; fitted but not tight. I love the fabric; cotton, not too thick, not too thin. Not drapey, but it doesn't bag out either. 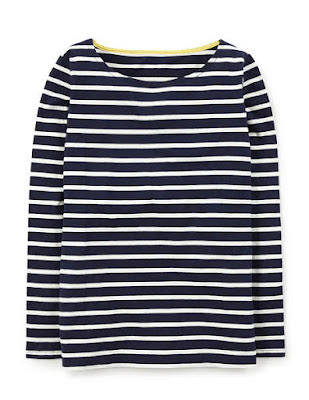 I love the colourway: navy with white stripes, which looks great both on its own, and under a bright cardigan. I love the neckline; bateau but with a slight scoop. I even love the little design details like the pink twill tape at the neckline (mine is pink - the above picture has yellow). And although my preferred sleeve length is 3/4, the long sleeves on this tee make it much easier to wear under cardigans in winter. I have known for a while I wanted to try to replicate this. I could just buy another, but where's the fun in that? My difficulty was in finding the perfect pattern and the perfect fabric (in the perfect colours). I don't ask for much. I did consider altering an existing pattern. 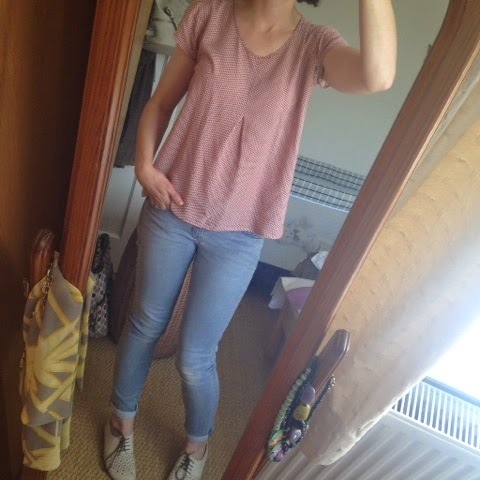 The Renfrew for example gets lots of good press (although wrong neckline), and the Bonnie tee was nearly there (but I didn't want the gathered shoulder) ,but something always made me hold off. Probably the lure of other exciting projects. I finally found the Tessuti Brigitte tee and it seemed to tick all the boxes. Bateau neck, slim but not tight fitting, a few sleeve length options. Perfect. The fabric is 100% organic cotton interlock, which I'd first spotted on the The Village Haberdashery, but when I eventually got round to buying it, she didn't have enough left. I googled the manufacturer (C.Pauli), and found a new to me website called Maude's Fabric Finds, which had the colourway and quantity I was after (and more besides. It took a lot of self control to not buy anything else. I will go back though). The colourway I bought is called Smoke Blue/White, and it's a beautiful grey blue colour. The fabric is lovely. It's thick and beautifully soft with reasonable recovery considering it has no elastane. Both websites said to factor in 5% shrinkage so I bought 1.25m, and I pre-washed it twice just to be sure, but I have plenty left. Enough to make Baby Boy some trousers or a tee. I cut the size 10 as per my measurements, but I decided to scoop the front neck a little - about 1.5cm , as per my Boden tee. I'm glad I did, as it now sits at the base of my throat. Next time I'll scoop out about the same again as I'd prefer it ever so slightly lower. I wanted the stripes to match as well as I could manage, so I spent a lot of time cutting out. I find drawing lines perpendicular to the grainline, onto the pattern piece really help. It was trickier than normal, as due to the stretch of the fabric, the stripes wiggled around a bit,, but I got there in the end. When sewing, I pinned every second stripe. It took a lot of pins, and it took ages, but I think it really helped. I also splashed out and bought a walking foot. At around £30 they are not cheap, but it's already earned its place in my sewing box. It's fantastic and I want to sew everything using it! In the spirit of honesty, some stripes still went awry, particularly on the sleeves, but on the whole, I am very very pleased with my stripe matching, and it's certainly no worse than a lot of RTW. It is difficult to do, but the satisfaction achieved, and the professional look is definitely worth the extra thought and work put in. *Some* stripes match at the sleeve, especially lower down, which was where I concentrated on, TBH. I mentioned that I liked the pink tape at the neckline on the Boden tee. I thought I would emulate this, and so used some swallow print tape I had got free with Cloth magazine a couple of years ago. The colour match is spot on. I used it on the back neck only, because you never really see the front neck insides and as the tape was 1.5cm wide, but not bias tape, it proved difficult to sew to the curve of the front neck. I'm delighted with this as a finish. It looks really good, and again, just gives that little professional detail I love so much. It also hides the really unsightly overlocking on the back neck. My overlocker and I are not getting on much these days. I cannot get the tension right, and it always looks messy. I only managed to overlock the necklines on this before 2 of the threads broke. As the fabric doesn't fray, I just left the raw edges unfinished - I couldn't be bothered to battle with it any further - but I really do need to spend some quality time with it to rekindle our relationship. The twin needle, on the other hand, was a dream on this fabric. No tunnelling whatsoever! The only problem was that I got so carried away with my bird tape on the back neck that I forgot to twin needle that part. So the front neck is twin needled and the back is standard straight stitch. The back neck is also a different colour thread, as I sewed that first, then decided the thread wasn't a good enough colour match to continue with, but neither was it so bad that it was worth unpicking. I'm calling it a design detail. On the subject of forgetting things, I also sewed quite a lot of this with a standard straight stitch, because I forgot to change it to the lightening bolt. In the end, only one bodice side seam and one sleeve and bodice (the sleeves are inserted flat) are sewn with the zizag and the rest are straight stitch. It seems to be OK so far though. Fingers crossed the stitching doesn't break! During construction, I did have an issue with the notches not matching up. I don't know if this is something I did, or if it's a problem with the pattern. For a stripe this narrow it didn't matter, I just ignored the notches and matched the stripes, but for a larger or less regular stripe it would have been a problem. Something to think about for next time, as I do fancy a larger stripe version. Fit wise I'm really happy with this. It's spot on in the body, and neck. The only thing I noticed (and really I only noticed it half way through the first day of wearing it, but then of course I couldn't stop seeing it) is that the shoulder seams are sitting really weirdly. They are fine from the underarm up to nearly the top of the shoulder, but then they suddenly veer off towards my neck, as if the very top of my shoulders are too wide. I don't have particularly broad shoulders and have never had to adjust a pattern here, so again, not sure if this is something I have done during construction, or just the way the pattern is drafted. The flat pattern piece looks fairly standard, so if I extend it, it's going to look really odd,, and I'm not sure how to approach as I don't want to add any width anywhere other than the very top of the shoulder. Any ideas?. It's not going to stop me wearing this version, but it definitely needs addressed for future versions. Here is a a lovely photo of clouds reflected in our kitchen window, and our burglar alarm. Oh, and the wonky seam at the shoulder! See how it just wanders off to the right about half way up the armscye? This will be a really great wardrobe basic, as I already know its the sort of thing I wear all the time. I definitely foresee more of these, in both stripes and solids. Maybe even a combo of both? It's super comfy to wear. And P's comment? "You made that? That's the best thing you've ever made!" I'll leave you with some timer outtakes, that somehow make me look like I'm dancing, because I have to find something good in these photos, and these make me laugh. Me Made May Days 23 to 31, and final thoughts. Last week and a bit. 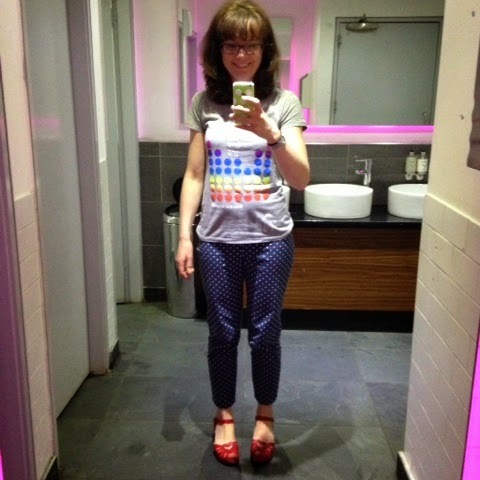 Day 23: SOI Ultimate Trousers with Belle & Sebastian tee bought the previous night, and Swedish Hasbeens. Day 6/8 of bottoms. We had stayed the previous night with my Mother in Law who had babysat the boys. We met my Father in Law for brunch, then I got the train back to Edinburgh (while the boys all stayed in Glasgow for a bit longer) to get my hair cut, and to squeeze in a bit of fabric shopping. Later we watched Eurovision. Day 24: Megan Nielsen Eucalypt Tank with Gap jeans and Birkenstocks. And a haircut!!! We had a lazy day, pottering around the house. It wasn't as warm as it looked so this was pretty quickly covered with a cardigan! Day 25: Pleat front Scout Tee with Gap jeans and Clarks brogues. Bank holiday, although the boys were at their respective nurseries in the morning. So we did DIY and housework in the morning, took Small Boy out for lunch to the local cafe, then picked Baby Boy up and went to Cramond for a walk/cycle along the foreshore (trying to teach Small Boy to pedal as he previously had a balance bike!). I also wore my metallic Linden for the walk. Quite like this photo angle! 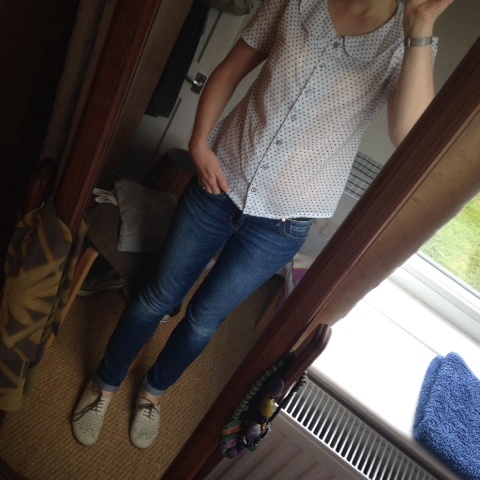 Day 26: Colette Violet blouse with Gap jeans and Clarks brogues. And bonus towel on the windowsill for some reason. Housework, nursery, a bit of sewing. 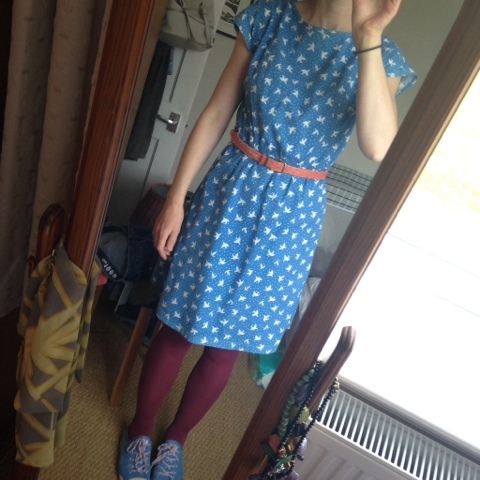 Day 27: Simplicity 2360 (unblogged), with tights (seriously weather, it's nearly June! ), crochet Converse and Oasis belt. Day 7/8 of bottoms. I honestly can't believe I have never blogged this dress. Although I haven't worn it since my early stages of pregnancy, I love this dress and usually wear it at least once a week to work. I actually made another version in silk. I must blog them. And I must make another. It was super comfy to wear today, particularly with the Converse (never worn them together before). 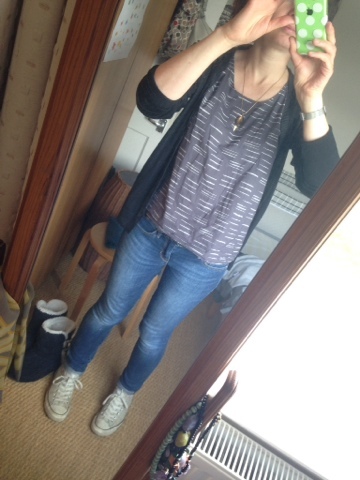 Day 28: hot off the sewing machine Tessuti Brigitte tee (as yet unblogged) with Gap jeans and Converse. The usual stuff. 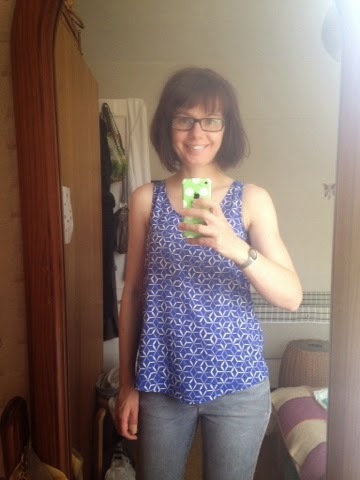 Finished this top the previous night, as a me made version of my Boden Breton tee. Really comfy and a good basic, although it doesn't go with my Ultimate Trousers like I'd hoped. 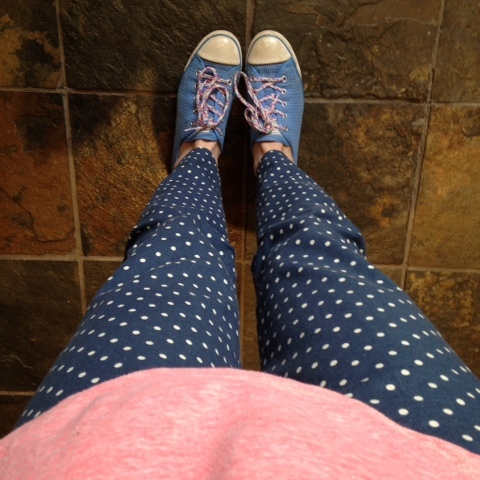 Day 29: SOI ultimate trousers with Oasis tee and Converse, and later my metallic Linden because we had hailstones today!! A day of pottering around and getting admin done, while waiting on my friend driving up from Manchester for the weekend. Day 30: Scout Tee with hubby's cardigan, Gap jeans and Converse. My friend was staying so we went to Hidden Door Arts festival. In the evening we got takeaway pizza and watched bad movies. This was a great outfit for both - cool (IMO anyway) and yet comfy! I made trousers! I am glad this month gave me the push to finally get on with it, as without my challenge, I think I'd still be procrastinating away. Unfortunately my trousers seem to have stretched out at the waist and so now don't fit that well and washing doesn't seem to make them shrink back. I''m currently deciding whether to see if I can somehow take them in again without taking them completely apart, or whether to start again. Either way, I'd like a version in a stretch woven at some point. I have also just bought the Named Alexandria Peg Trousers and some fabric, so I hope to get cracking with them soon. My month mainly featured jeans with Scouts and/or Lindens. In fact I think my metallic gold Linden probably wins the prize for most worn item. 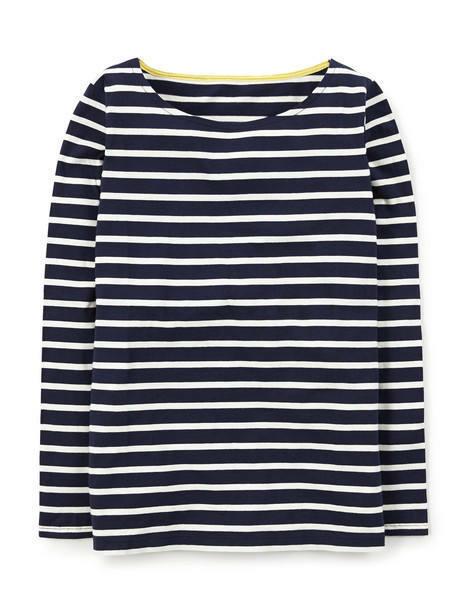 If I hadn't made my Breton tee so late in the month, I think that would also have featured very regularly. I have just won (I know!) the Emmeline Tee from The Little Tailoress, which I think will be another great basic pattern, particularly as it can be made in both wovens and knits and has 3 sleeve variations. At some point, I need to make another French terry Linden. At some point I should make jeans, but I am not in need of them at the moment, so will park this idea for now. I regularly wear 3 items purchased from Oasis, all of which are orange. I ought to sew more in this colour, as it really is a neutral for me. I had no real desire to wear dresses or skirts. Partly this was comfort/practicality driven, but even once I did wear them comfortably (my red denim Kelly and my bird dress) I still had no real desire to repeat them. It will be interesting to see how this impacts my wardrobe once I return to work, where previously I predominantly work skirts/dresses. Ditto my Vintage Pledge, which is to make a shirt dress. In light of most of the above points, I really should have a clear out pretty soon, while it's fresh in my mind what I no longer want to wear. Taking selfies from above really is more flattering. I am really pleased with how my casual handmade wardrobe has grown since I last took part 2 years ago. 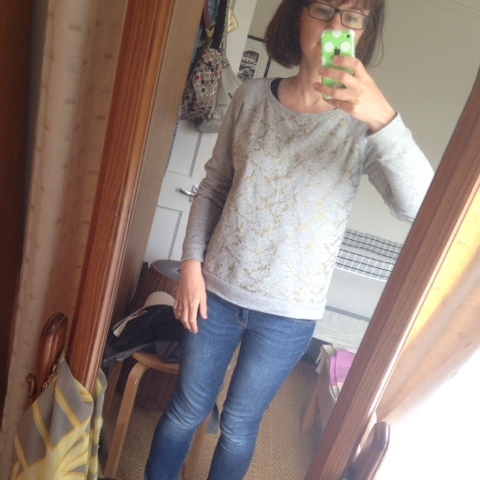 Then, I had one knit tee which I didn't really like, and I found casual days really difficult. This time around there was a lot of repetition, but I'm OK with that, and it was pretty easy to find something to wear each day. I LOVED playing along on Instagram this year. It was such fun scrolling the hashtag, seeing what everyone was wearing and joining in the chat. Lots of inspiration, more Instagram friends and blogs to follow. And the validation and confidence boost of receiving lots of "likes" on a daily basis was nice too! I'm missing it already! So, what about you? What did you learn? Any epiphanies? And are you missing it, or glad it's finally over?